The EPA 2010 emission regulations require more than an 80% reduction in Nitrogen Oxide (NOx) compared to the EPA 2007 emission levels. To meet these tough new regulations, Hino has selected the most environmentally friendly and reliable solution – Selective Catalytic Reduction (SCR). SCR is a proven technology that is in use in Japan and Europe for truck, bus and industrial applications. It is the best solution to meet the EPA 2010 emission regulations. SCR is an exhaust after treatment system that virtually eliminates harmful oxides of nitrogen (NOx) from exhaust gases. To meet the EPA 2010 regulations, the vehicle NOx emission level must be no more than 0.2 grams hp/hr. Hino’s SCR system requires the use of DEF. By mixing NOx from the engine’s exhaust with the ammonia (NH3) contained in DEF, it is converted into harmless water vapour (H2O), nitrogen (N2) and small amounts of CO2 through a chemical reaction within the catalyst. SCR is an efective, dependable and economical solution. The design of the SCR unit ensures that your vehicle will provide ease of operation and require minimal maintenance. The SCR unit along with the DEF tank is located under the passenger steps. The Diesel Particulate Filter (DPF) is a device which captures diesel particulates preventing their discharge into the atmosphere. Collected particulates are incinerated in a process called “regeneration”. Diesel Exhaust Fluid (DEF) is a solution made from 67.5% purified water and 32.5% automotive-grade urea that serves as a carrying agent for the ammonia needed to reduce nitrogen oxide (NOx) emissions from diesel engines. Hino DEF is sold in quantities from 9.46L jugs to 1249L bulk containers. You will be able to order Hino DEF through Hino Dealers. Operating an SCR-equipped HINO is straightforward and simple for drivers and feet owners. New display features for the driver include Diesel Exhaust Fluid (DEF) level monitoring, warning lights and audible warnings. From a driver’s standpoint, it does not get any easier; simply refll the DEF tank at normal refll intervals. 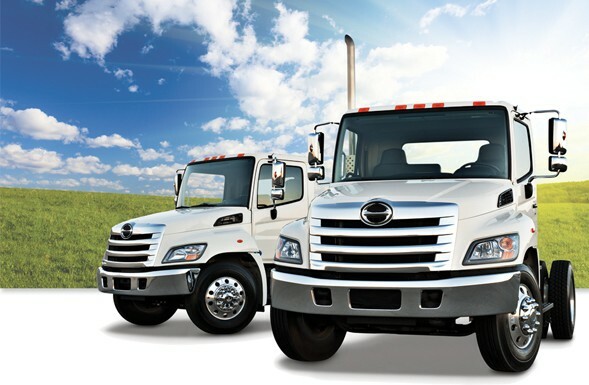 Hino’s concern for the Global Environment has made it a leader in advanced engine and emissions technologies. Hino’s Selective Catalytic Reduction (SCR) system is standard on all Hino EPA 2010 models. The system fully complies with EPA 2010 standards by converting nearly all harmful exhaust gas emissions into nitrogen and water vapour. Hino Trucks? Now we can all breathe a little easier! DEF is available from your Hino dealer. It is also available at most truck stops and fueling stations across Canada and USA. How much DEF will the Hino engine use? Hino’s testing results show that the engine will use between 1-2% DEF for each litre of fuel consumed. The exact percentage will vary based on how the truck is used. The SCR system does not produce any unusual or strange smells. 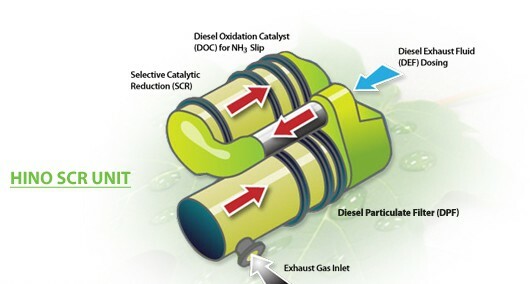 Will Selective Catalytic Reduction (SCR) have any effect on the oil change intervals? No, there is no effect on recommended oil change intervals. I heard that DEF freezes at -11.1 degrees Celcius; will this affect vehicle operation or vehicle emissions? DEF starts to get slushy at around -11 degrees Celsius (12 degrees Fahrenheit). The Hino SCR system circulates engine coolant to the DEF reservoir which warms the DEF at low temperatures. Vehicle operation is not affected at low temperatures and DEF injection will proceed following warm-up at low temperatures. Does DEF smell? I’m worried about storing it in our warehouse. DEF contains 67.5% water (H20) and 32.5% urea solution which has an aroma similar to diluted ammonia. Since DEF is an aqueous solution, even if it spills onto the foor, it can be easily cleaned up with tap water. 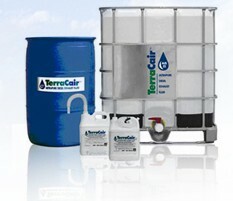 DEF is considered non-hazardous; in fact, agricultural grade urea is used as fertilizer. What is the size of the DEF tank on Hino trucks? The DEF tank capacity is 19 litres. How far will the truck run on one tank of DEF? Similar to fuel economy, it depends upon vehicle operating conditions. A truck achieving a fuel economy of 22-28 L/100 km (10-13 MPG) is estimated to run 3900 km-5000 km (2400-3100 miles). The EPA2010 regulations require that the engine output be de-rated if the vehicle runs out of DEF. Hino has incorporated a comprehensive onboard driver warning system to advise when DEF levels are getting low. If the truck runs completely out of DEF, it will continue to operate at reduced power levels. In the case of an emergency, DEF will be available for purchase through the HinoWatch Roadside Assistance Program. Does SCR infuence fuel economy? Because SCR reduces NOx downstream of the engine, it allows the engine design to be optimized for maximum fuel efficiency. Hino is anticipating a fuel economy improvement of 3 – 5% versus the previous model. Will an SCR-equipped truck drive any differently? The drivability of a 2011 Hino truck equipped with SCR will be the same for the 258 and 268 models and will be improved for 338 and 358 models, compared to the previous models, due to an improvement in engine performance. Will an SCR-equipped vehicle’s exhaust brake work the same? Yes. The SCR system does not affect the exhaust brake operation and will not change engine braking performance. Does SCR require additional maintenance? Hino’s SCR system is designed for long term durability and reliability. The only additional maintenance requirement is the replacement of a DEF sediment filter every 360,000 kms (220,000 miles). Hino uses a plastic resin material for the DEF tank and piping, eliminating corrosion concerns. Does DEF evaporate at high temperatures? DEF should be stored in a closed vessel to prevent evaporation and contamination. It should be stored between -12 degrees and 32 degrees Celsius (10 and 90 degrees Fahrenheit). Since DEF changes NOx into H2O and N2, how will the water be emitted from the after treatment system?Because of the high operating temperatures of the exhaust system, water vapor will be produced and will exit via the truck’s exhaust system. In colder temperatures, the water vapour may condense and may be visible as droplets and water vapor. Do we have any statistics to back up the claims that SCR systems use less fuel, are more durable and will have fewer DPF regenerations than one of our competitor’s Massive EGR? Because this is new technology, we have not yet collected and analyzed competitive data. Fuel consumption is not reduced by simply installing SCR, but because of higher fuel combustion efficiency in the engine itself, overall fuel efficiency is improved. For Hino, the ability to meet strict emissions and fuel efficiency guidelines afford-ably without compromising drivability and performance is paramount. The ability to reduce emissions to near-zero levels distinguishes SCR as the only emission control technology that is as good for your business as it is for the environment. The net result is a more cost effective vehicle that is friendlier to the environment!